FileZilla is Arguably the most Popular FTP Client in the world. Also, it is a free and Cross platform Support FTP Client which can be installed on both Linux and Windows Operating Systems. In This tutorial You Will Learn How to Install FileZilla on Centos 7. 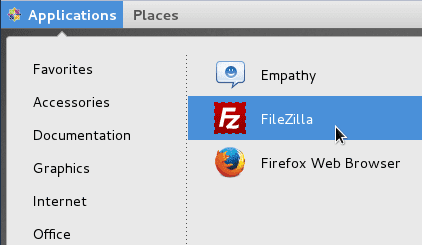 After the Installation is Finished, Go to Application > Internet Then open Filezilla.